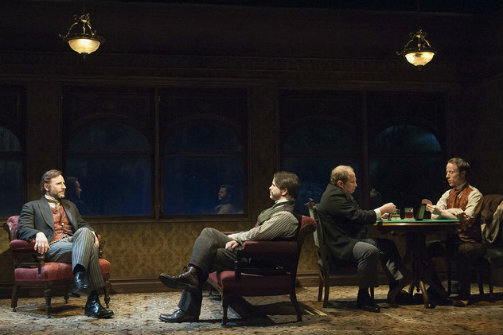 (L-R): Jordan Lage, Jason Ritter, Jim Frangione, and Nate Dendy in Ghost Stories: Prarie du Chien. Photo by Ahron R. Foster. BOTTOM LINE: Although there is a gunshot warning when you enter the theater, these ghost stories are much more talk than action. If you associate Mamet with fast dialogue, curse words, and men yelling at each other, you might be surprised by Ghost Stories. The cadence is still unmistakably Mamet, but people speak more carefully and quietly, especially in Prairie du Chien, the first of the two short plays. Prairie du Chien takes place in a railroad parlor car at three in the morning. The year is 1910. Two men (Nate Dendy and Jim Frangione) play cards as another man (Jordan Lage) tells an attentive listener (Jason Ritter) a story about a murder. The listener's son (Henry Kelemen) sleeps in his lap. It can be a little hard to hear Lage because of the noise from the card game and how softly he speaks, so you really have to listen. It's quite a lesson in storytelling. The tale is somewhat disappointing as far as ghost stories go, but the way he tells it is hypnotic. Prairie du Chien was first produced for NPR's Earplay in 1979, and although Lauren Helpern's set and Jeff Croiter's lighting provide eerie atmosphere, it would work just as well if you could only hear it. Lage's voice is really all that is needed. The second play, The Shawl, is a bit more entertaining, even though it's the first one that has a gunshot. Miss A (Mary McCann) seeks answers about her mother from John (Arliss Howard), a professed clairvoyant. His younger lover Charles (Ritter) insists that John take advantage of the woman. The intrigue is in whether or not John is a real clairvoyant, or if he's just really good at faking it. The program doesn't specify the time or place. It was written in 1985, but aside from the modern dress (Linda Cho designed the costumes), it feels timeless. Ritter is probably the biggest name in the cast and it's hard not to wonder why he chose this play. He isn't given much to do besides passively listen, but then again, not every role needs to be a showy one. Maybe listening is a good exercise for an actor. And for an audience member.